Mary Jemison was born in 1743 aboard the ship William and Mary in the fall of 1743 while en route from Northern Ireland to America. Upon their arrival in America, the couple and their new child joined other Scots-Irish immigrants and headed west from Philadelphia to what was then the western frontier (now central Pennsylvania). 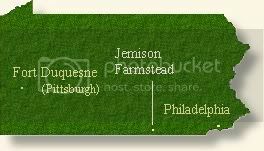 The Jemisons squatted on territory that was under the authority of the Iroquois Confederacy, and Mary grew up on that farm, 10 miles west of present-day Gettysburg, Pennsylvania. Although life was hard on the western edge of the colony of Pennsylvania, Mary fondly recalled these “childish, happy days” full of hard work and the love of a family that then numbered six children. During the time the Jemisons were establishing their home, the French and Indian War was raging throughout the American Colonies and Canada. It was a bitter struggle between two European powers, and colonists and native people of both sides suffered. Those on the frontier suffered the most. On April 5, 1758, 15-year-old Mary and her family along with visiting neighbors were taken from their frontier home by a raiding party of Shawnee Indians and their French allies. Mary’s two older brothers were at the barn and escaped the raid, but Mary, her parents, and the rest of the family were taken captive. The raiding party headed west toward Fort Duquesne (Pittsburgh). The decision was made to lighten their load since they had too many captives to outrun the pursing militia. At nightfall, they separated a tearful Mary from her family, along with a neighbor boy who had also been captured, and led them away. The rest of the Jemison family were killed and scalped. At Fort Duquesne, Mary was purchased by a party of Seneca Native Americans, who loaded her in a canoe and headed down the Ohio River. When she arrived at the village, Mary was adopted by two Seneca sisters as a replacement for their brother who had been killed in the French and Indian War. She was named Dehgewanus, or Two Falling Voices. It is a custom of the Indians, when one of their number is slain or taken prisoner in battle, to give to the nearest relative to the dead or absent, a prisoner, if they have chanced to take one, and if not, to give him the scalp of an enemy. On the return of the Indians from conquest, which is always announced by peculiar shouting, demonstrations of joy, and the exhibition of some trophy of victory, the mourners come forward and make their claims. If they receive a prisoner, it is at their option either to satiate their vengeance, by taking his life in the most cruel manner they can conceive of; or, to receive and adopt him into the family, in the place of him whom they have lost. It was my happy lot to be accepted for adoption; and at the time of the ceremony I was received by the two squaws, to supply the place of their brother in the family; and I was ever considered and treated by them as a real sister, the same as though I had been born of their mother. During my adoption, I sat motionless, nearly terrified to death at the appearance and actions of the company, expecting every moment to feel their vengeance, and suffer death on the spot. I was, however happily disappointed, when at the close of the ceremony the company retired, and my sisters went about employing every means for my consolation and comfort. Eunice Williams was born in Deerfield, Massachusetts, on September 17, 1696, the daughter of Puritan minister the Reverend John Williams and his wife Eunice Mather Williams. The girl who would grow up to become the most famous “unredeemed captive” had a conventional New England Puritan upbringing until the age of seven. Her family’s wealth and prominence made her early life a bit more privileged than that of other young Deerfield girls, and her fate as an adopted Kanienkehaka (Mohawk) better known. On February 29, 1704, in the pre-dawn hours, a force of about 300 French and Native allies launched a daring raid on the English settlement of Deerfield, Massachusetts, that became known as the Deerfield Massacre. 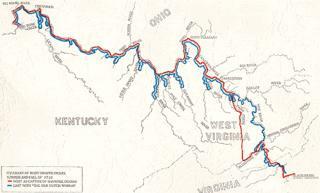 The red line shows her movement west as a captive of the Shawnee Indians, and the blue line her return east. The entire trip took place in the summer and autumn of 1755. Born in 1732, Mary Draper was the daughter of George Draper and Eleanor Hardin, Irish immigrants to Philadelphia. In the 1740s, the Drapers were among the first white settlers to scale the Allegheny Mountains, which were the western edge of colonial exploration and settlement at that time. They, along with Colonel John Patton, Thomas Ingles and his sons William, Matthew and John settled a natural glade that was well watered by natural springs and streams. The area required much less effort to establish a farm than heavily forested land. The land they chose became known as Draper’s Meadows. Hannah Dustin/Duston was a forty-year-old colonial New England woman who was captured during an Indian raid, and escaped from her captors by killing them in the night and fleeing in their canoe. She is believed to be the first woman honored in the United States with a statue. 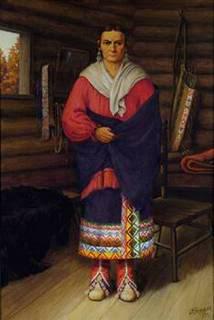 Born Hannah Emerson on December 23, 1657, Hannah Dustin, her husband Thomas, and their nine children were living in Haverhill, Massachusetts, when the town was attacked by Abenaki Indians on March 15, 1697. 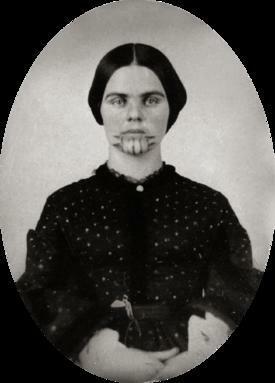 Thomas fled with eight of the children, but Hannah, her six-day-old baby Martha, and her nurse Mary Neff were captured. Born around 1637 in Somerset, England, Mary White was the sixth of ten children. Her family immigrated to New England when she was very young, settling first in Salem and later in the frontier town of Lancaster in the Massachusetts Colony. In 1656, Mary married Joseph Rowlandson, the Harvard-educated Puritan minister of Lancaster, and for the next twenty years she occupied the role of a Puritan wife, tending to her home and raising children. While her husband was away in Boston trying to convince the Colony’s leaders to provide military protection for the town, Mary Rowlandson’s life was radically disrupted on February 10, 1676, when a contingent of Narraganset Indians attacked and burned Lancaster.